The weekend brought with it some wild weather with wind and much needed rain but also a hint of the change in seasons. Spring is approaching and it was reflected in the fabric choice for this next project. The initial plan for these fabrics had to be shelved due to unforeseen circumstances (read: put in the too hard basket!) , and as I had already cut all the fabrics a rescue plan had to be instigated to save the fabrics from the overflowing scrap bin. This quilt top now needs a backing which I will work on today. I am quietly hoping to also baste this today, but I know Domestic Diva is required to attend to the chores to restore order. WOWEE! That is just proclaiming from the rooftops - SUMMER!!!!! You have spring in the air and here in Texas we have fall in the air! I love those fabrics! Nice save! Love those citrus colours! Gorgeous! 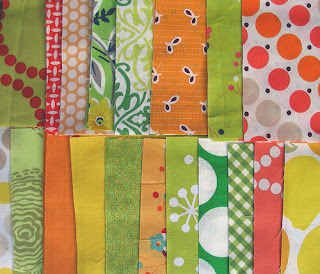 Oh, my gosh, what happy fabrics! Beautiful! love the colors. Funny how you are waiting for Spring and we are waiting for Fall. You really have a way with fabric! I adore those bright cheery colors! Are those possibly triangles? Can't wait to see it in full! Cheers! I love the colours in this, so bright and happy. Can't wait to see it finished. HELLLLLLLOOOOOO Geese!!! OH Rita...my heart has just skipped a beat! I just love those colors together! That will be one fantastic quilt! How gorgeous is the sunshine today!?! 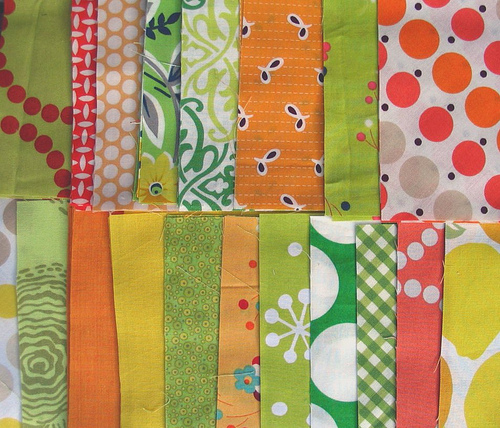 Wow what a lovely summery quilt! Looks a bit triangular like the one I'm working on? Mine is in wintery colours, which is a bit odd come to think of it as we are now in Spring! Would love to use those colours next. We're deep in the hottest part of summer here in New York, so Spring is nothing but a faint memory. What a great quilt to cheer it in! Join the club -there is another Domestic Diva here today, too! 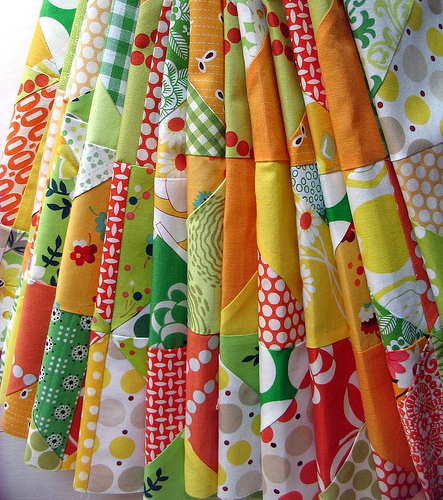 In between chores - just admiting this gorgeous upcoming quilt - also ordered your Fabric of the Day - what a great idea! Wow, absolutely gorgeous. The way you have it photographed looks like it's hanging, like a beautiful shower curtain! Love the colours! What was the first plan? It's such a happy color combo! Lovely, fresh colors! This is a great way to bring the spring into your home! can't wait to see this one together...Awesome. katie jump rope!! oh my heavens i want it!! Your teasers are PAINFUL! These fabrics are absolutely gorgeous together, I can't wait to see this top spread out and quilted too! Wow those colors and fabrics are mouth watering! This is stunning! I love the color pallette and the prints you used! I couldn't resist adding this to our link luv roundup today! Come by for a peek!